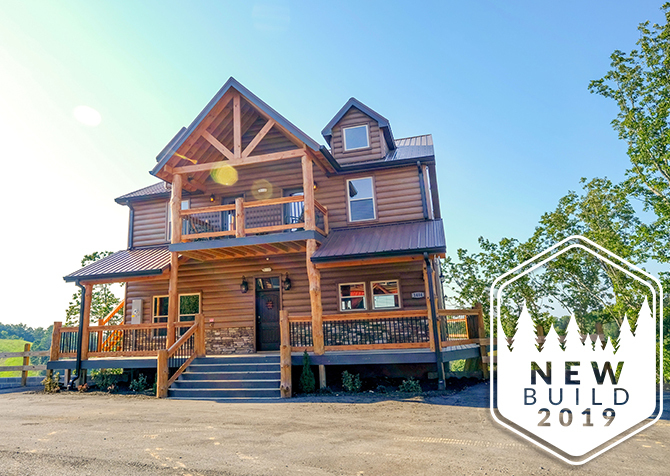 Nestled in Cedar Falls Resort, a gated community in Pigeon Forge, this 1-bedroom, 2 ½-bathroom cabin with a loft features not only in-cabin amenities — such as an outdoor hot tub, indoor jetted tub, fun rec room, and serene wooded views — but also community access to an outdoor pool, nature trail, playground, fishing pond, and more! You may have to remind yourself to go into town when the best Smoky Mountain vacation can be fully experienced at this incredible cabin! With the ability to accommodate up to 6 guests, Cedar Forest is prefect for family trips or getaways with friends, boasting a king-size bed in the master suite, a queen-size bed in the loft, and a queen-size sleeper sofa — the kids will enjoy this one! Want to dish up your grandmother’s secret recipe? Step into the fully equipped kitchen to make it happen, complete with an island in the center, modern appliances, and plenty of cookware and dishware. After dinner, gather the crew in the living room for movie night on the big screen TV or a game tournament with the pool table and arcade unit in the rec room. At Cedar Forest, family memories are created, and friendship bonds are strengthened. Start your relaxing vacation in the living room with a mood-setting fire in the stone fireplace (gas), an array of snacks on the coffee table, and a comedy show on the big screen smart TV — cable with premium channels provided! Grab a pillow and snuggle up on the couch, chill on the love seat with your sweetheart, or read the latest release of your favorite series in the arm chair. With beautiful views of nature streaming in from the large windows all around, you’ll feel at peace and right at home in this Smoky Mountain forest. Featuring a large island with a built-in stove and bar seating for 4, the dream kitchen in this home will have you eager to make meals any time of day! For breakfast, toast raisin bagels in the toaster, brew a pot of joe with the coffeemaker, and grab cream cheese from the fridge. Wash veggies in the double sink and whip up a hearty meal on the stove for dinner. For dessert, bake homemade goodies in the oven — don’t forget the ice cream from the freezer! With painted cabinets, warm wood walls, and plenty of amenities and space to make whatever meals you want, this beautiful country kitchen will welcome you in! Boasting a round table for 4, the dining space is just off the kitchen, keeping you close to the lovely wooded views, which adds to the ambience of a perfect family meal. With natural light from the large windows, utilize this area for arts and crafts or coloring time with the kids or board games and cards late into the night. For an evening of gaming delight, head to the rec room to tackle the arcade machine — featuring 62 games, from Pac-Man to Donkey Kong. While you await your turn (or if someone keeps hogging Galaga), challenge your friends to enter the foosball arena. Kids feeling extra energetic? Move the coffee table back a smidge, turn on some music, and get a dance party started! If you feel a bit tired, just plop on the couch, conveniently made with drink holders built in to keep hydration well within reach. As an added bonus, this rec space also has a big screen TV, making it easy for the little ones to enjoy a Disney classic with the DVD player while sports fans watch the big game on the big screen TV in the living room — it’s win-win! After shaking your groove thang for a while, go for a nice, hot shower, slip into your PJs, and hop in the king-size bed for a night of sweet dreams in the master suite. Though, if you’re too excited to sleep, enjoy a long bath in the jetted tub or a film on the flatscreen TV. There’s also a queen-size bed and a queen sleeper sofa for additional sleeping arrangements in the loft, which boasts a flatscreen TV to keep guests entertained before bed. When you come to the Smoky Mountains, the best place to be is outside in the fresh mountain air. Providing a covered wraparound porch with rocking chairs, a swing, gas grill, a picnic table, wicker chairs, and an outdoor dining table for 4, Cedar Forest makes outdoor living a dream. Host a barbecue party with friends, enjoy dinner with the sounds of nature, and rock away all your worries and cares. Plus, there’s another porch swing and a hot tub with a TV on the lower-level deck (with private access from the master suite) for evening soaks with a show. With paved parking for 3, including room for a trailer, carpooling is certainly an option but not a requirement. Believe it or not, there are even more amenities at this cozy abode, including a washer and dryer, high-speed internet, and unlimited long-distance calls (within in the continental US). Additionally, guests will have community access to all Cedar Falls Resort has to offer, from frolicking at the fenced playground to taking a peaceful walk on the nature trail. Play volleyball, basketball, or horseshoes with your buddies, dine with your family in the picnic area with smores around the firepit, and snag a few whoppers at the catch-and-release fishing pond. While it may be hard to leave the innumerable amenities of Cedar Forest, taking a peak in town may be worth looking into as Pigeon Forge boasts tons of local attractions, quaint eateries, unique museums, and seasonal events. Meet celebrities galore at the Hollywood Wax Museum, featuring Elvis Presley, Brad Pitt, Natalie Portman, Bradley Cooper, and more! View tropical birds of all kinds, sneak away to the secret garden, and visit the baby bird nursery at Parrot Mountain and Gardens. Featuring beautiful views of the Great Smoky Mountains, the 18-hole course won’t disappoint at the Gatlinburg Golf Course.